August is an exciting time in Oregon's Mt. Hood Territory, as the fields erupt in a sea of color at Canby's Swan Island Dahlias. Swan Island Dahlias is celebrating their 90th year in business, and in that time they've grown quite a bit. (See what we did there?) They are now the nation's largest dahlia grower, sending flowers all over the world. 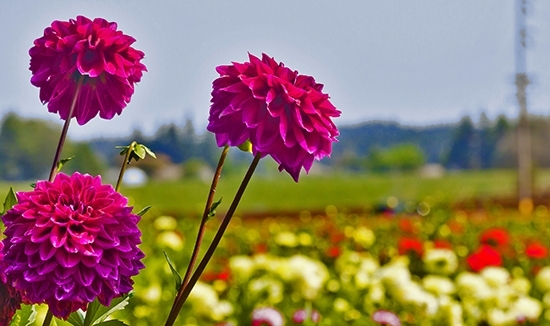 The best way to experience their flowers is to attend the annual Dahlia Festival. The free event runs Friday-Sunday both August 25-27 and September 1-3. Not only do guests see several acres holding hundreds of dahlia varieties blooming, but there are also 15,000 cut flowers and 400 arrangements on display; the largest exhibition from just one grower in the country. Since there is also live music, food and wine from local vendors and kids activities, it's the perfect event to make a day or even a weekend of. The community of Canby has a lot more to do too. If you are in the mood to explore, drop in next door at the Flower Farmer, relax at the Molalla River State Park or take a meandering ride across the historic Canby Ferry. Kids will love Bricks and Minifigs, where they specialize in everything Lego. Wine lovers will want to visit St. Josef's Winery, one of the pioneers in Oregon's now bustling wine industry. Or treat yourself to sweets at Ladybug Chocolates and Puddin' River Chocolates, both in Canby's charming main street district. There are plenty of nearby lodging options to round out your flower frolicking getaway. When you do visit, be sure to take lots of photos, and share them using our #omht hashtag. We love it when our Instagram and Twitter feeds are filled with gorgeous flower photos.